The DFRobot Relay shield V2.1 is capable of controlling 4 relays. The max switching power is DC 90W or AC 360VA. It is possible to control the Relay shield through Arduino/DFRduino using digital IOs with external 7 to 12V supply. With the built in xbee socket, it can be wirelessly controlled via Xbee/bluetooth/WPM. This makes it an ideal solution for automation and robotics. Note: NC: Normally Closed; NO: Normally Open. Servo Power Supply: Just can supply power to the digital IO pins. You can connect the middle pin header after you unplug the jumper, to Arduino digital IO with jumper cables depend on your needed pin mapping to drive relays. For example, when you use the board with an Arduino Ethernet board. They will conflict the digital 10, so you should remove the jumper on D10, and connect the middle pin to other digital IO. 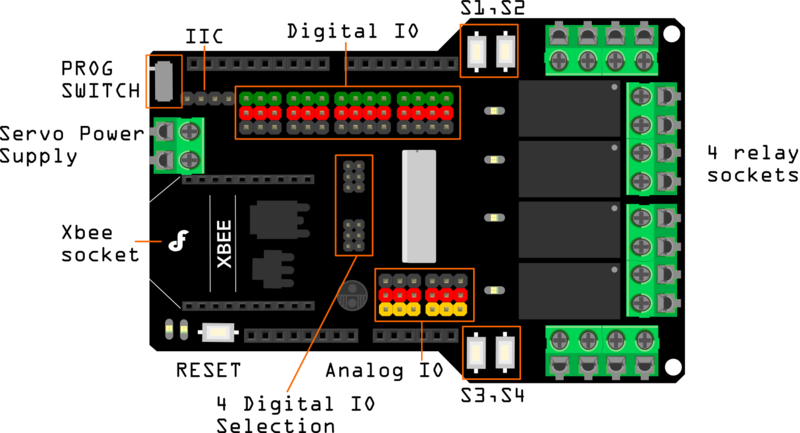 XBee interface:　The XBee module supports Xbee radios, Bluetooth Bee, and the Wireless programming module. This gives the project a versatile wireless communications capability. 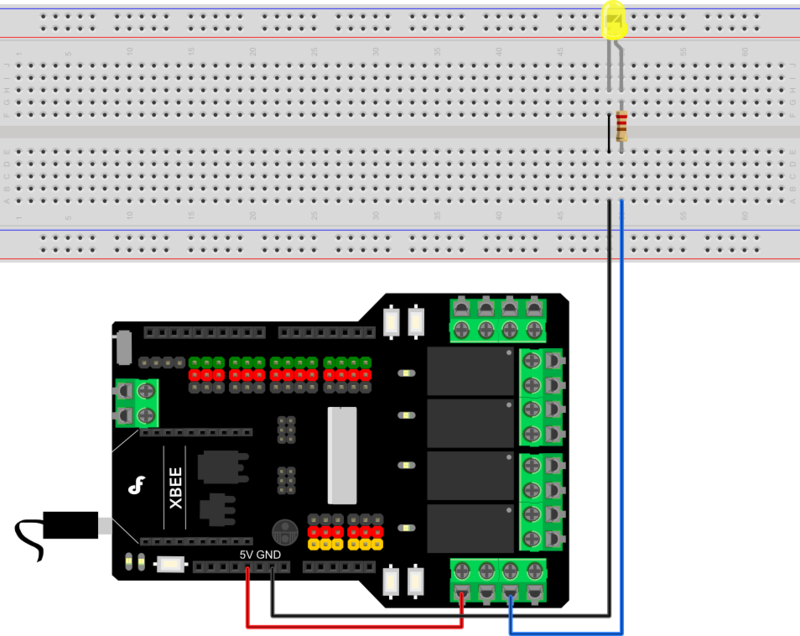 In this sample connection diagram it shows how LED can be controlled via relays, while this is a bit of overkill for controlling LEDs its only meant to be an example. These relays can be used to control lamps, or some other mid-voltage range appliances. We will use "NO" for our example, using "NC" will simply reverse the logic, as explained above. We recommend using a swappable cable to do this with, as using a relay requires you to perform some minor surgery on the appliance's cable. 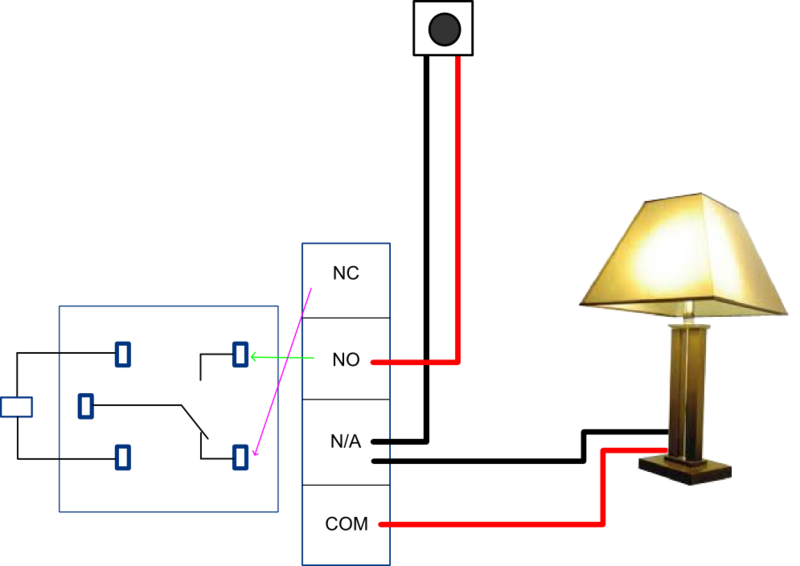 To plug in an appliance such as a lamp: Cut and strip a portion of the positive wire so that you end up with two ends of the wire as shown in Figure 2. The relay should have the positive wire of the device being used connected to "COM" and to "NO" as shown in figure 2, and any digital signal pin on the arduino end (For example pin 13). Sending a digital high or a "1" will trigger the relay. Sending a digital low or "0" will disable the relay. Please be vary carful not to play with live circuits! 120V or 220V should not be taken lightly. Make sure the appliance to be tinckered with is unplugged from mains. DO NOT CONNECT IT TO THE WALL WHILE MESSING WITH THE CABLE! # This Sample code is for testing the Relay shield V2.1 for Arduino. Q1 I uploaded the first sketch to arduino, the 4 relays should be turned on and off every second, but nothing happened. What did I miss? A1 It needs an external power supply to drive the xbee module and relays. Suggested: 7-12V. Q2 I got te shield working with several types of code but need to have both 9V power and USB cable conected. This can't be right.? A2 Please check if your power supply was working correctly. Q3 Is it possible to use Arduino D4 to control Relay 1? A3 It's easy to make it just by removing the jumper on the board and then connect the pin of Relay1 to any Digital pin you need, read more on DFRobot Forum. 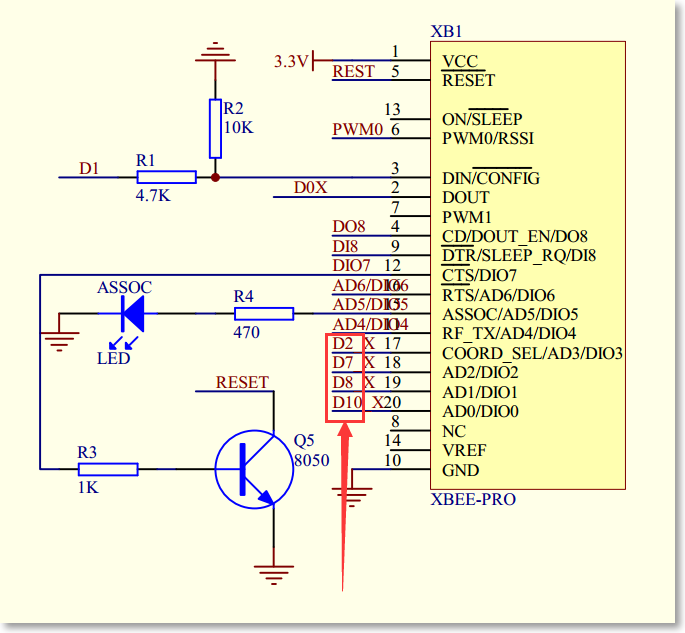 Q4 Is it possible to use Arduino D4 to control Relay 1? A4 It's easy to make it just by removing the jumper on the board and then connect the pin of Relay1 to any Digital pin you need, read more on DFRobot Forum. Q5 With your relay shield v2.1 is it possible for the Arduino to read the status of some of the digital I/O pins of an XBee? Because the XBee is 3.3 volt there would need to be a logic level converter on the board, I believe. A5 It is OK. 3.3V will be recognized as high level. 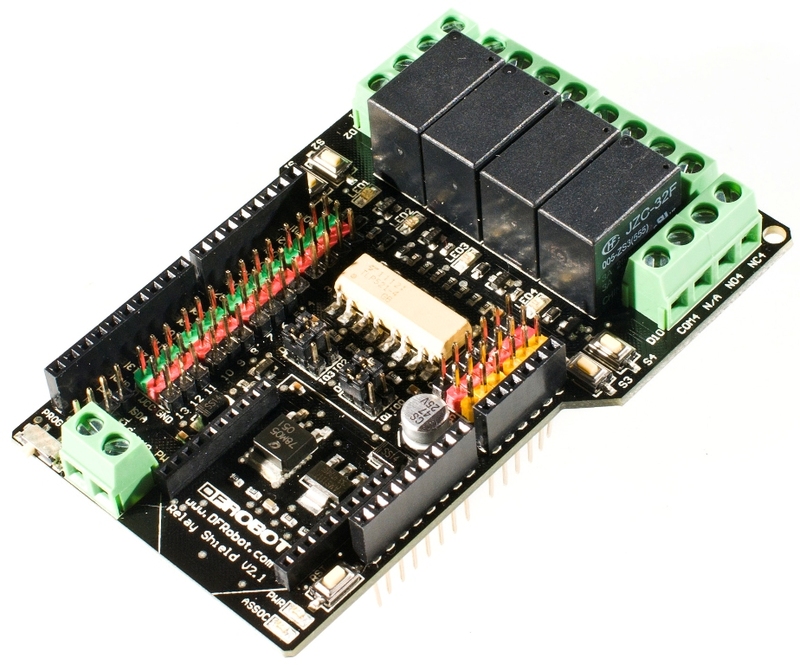 Get Relay Shield for Arduino V2.1 SKU:DFR0144_ from DFRobot Store or DFRobot Distributor.